I've actually failed rather well in accomplishing what I set out to do...that is attracting private investment to an area of Buffalo just down the street from my own place - the Woodlawn Row Houses. They are located in what i thought might be considered a rather fertile area of the City's near East side and firmly within the boundry of a recent infusion of 50m of public investment in the arts and education. This decision was not made lightly. Year end is always a good time to re-evaluate priorities and existing ways of doing things. Be it personal matters or here in the 'hood, coming to terms with what I've observed as accelerating neighborhood decline in our post-industrial weak market City, well...let's remember one thing - hope is not a plan! Poorly conceived short term decisions, have long term consequences. 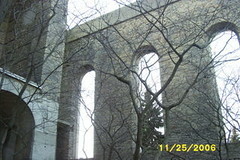 Spend time with those you love this time of year, explore Buffalo...and never go into vacant buildings alone! I've spent the past six weeks working with an investment group - east and west coasts. They visited the Woodlawn Row Houses three times, did legal work, met with City officials and hired a local architect to complete a feasibility study. Learned this week that it's not going to fly...tried hard and failed well. If anyone is interested in that study, let me know as I could make arrangements with the architect. Aside from the very recent sale of 39 Coe Place - not a single vacant house in my neighborhood has received any love in the past five years. The abandonment and hollowing out continues to happen at what seems to be a record pace. 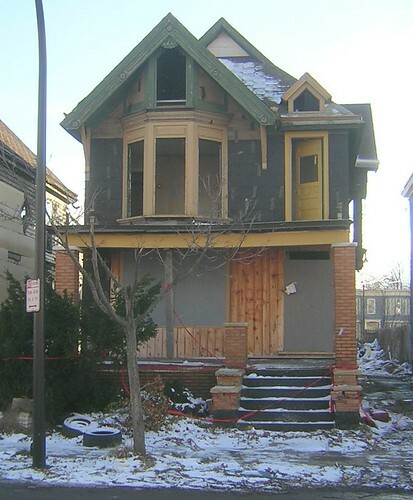 Houses that are in good structural shape get demolished and houses that I once thought were occupied are now actually vacant. Just got back from a walk around the neighborhood and eight houses, including the Woodlawn Row Houses are wide open - five of them owned by an organization controlled by a member of Buffalo's Fiscal Stability Authority. One house 1470 Michigan Avenue - owned by the City - still has water running after the copper was stripped out, filling the basement, despite dozens of calls to have it turned off. I simply can not keep up with the pace of decline that's happening less than a block away from my house. Walk around at night at least twice a week and keep track of which places are open...in 26 months this is a record. A resurection may be possible at some point...yet at this time, I doubt it. May think differently after some additional travel time, completion of a rather innovative project around the house and some academic work. Don't know. If you've enjoyed the writing and pics, thank you. I'll keep the comments functional for awhile and gradually shut things down. Bye. One of the unexpected results of blogging is being on the receiving end of countless emails from people near and far who love Buffalo, NY. 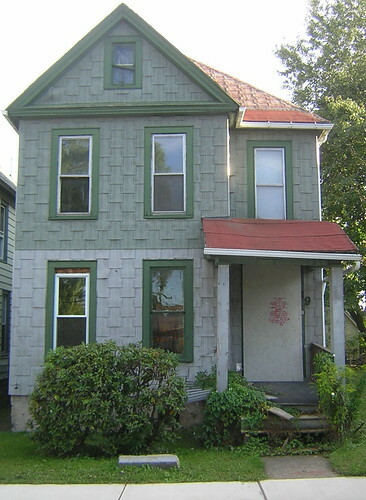 Lots of email from local and regional artists interested in Artspace and others about local investment strategy and still others about asking for help locating the old family house somewhere on the urban prairie in forgotten Buffalo. Generally receive 15-20/day and some really standout. Mary Ann Herrington from Dunkirk, NY sent this in last week. She addresses a major concern regarding the Diocesan - Journey to Avoid Housing Court - that's captured my attention for the past two years here on the City's east side. I just stumbled across your Web site last week and I love it. I'm especially interested in your articles about the imminent closing of some of the Catholic Churches in the diocese. In fact, I am a writer for my hometown newspaper in Dunkirk and have written several columns on this topic. Well, I must have struck a raw nerve or two with the diocese, because none other than Kevin Keenan himself wrote a letter to my publisher claiming, among other things, that I was a simplistic, self-serving and totally unprofessional bishop-badgerer and should be banned from writing any more columns. My boss, not being a big Kevin Keenan fan, handed me the letter to do with what I please. I have continued to write columns and feel you have a wealth of information here for me to draw from. I especially like "79 Oakland" and the "McChurches." I'm sending you the first column I wrote on "the Journey". Feel free to post it and any or all comments I send you. You will see that diocesan blight is not confined only to Buffalo. While away this past week I heard from two of Coe Place's coolest residents. Roy and Jen from - Love on Coe Place - just closed on the house next door, 39 Coe Place, that had previously been held hostage by MBBA. Ever since stumbling on Coe Place, over ten years ago, I've known 39 Coe Place to be vacant. Sunday afternoon I had a chance to catch up with Roy and Jen and discuss their plans for the house. They're very excited about the changes in the neighborhood with Artspace happening next door and Roy shared a few rehab ideas with me. Roy's persistance in shaking this house loose from MBBA's grasp should serve as a model for other people interested in doing the same. Now only 28 Coe Place is still hanging on life support. Next time Eliot Spitzer is in town...you'll know where I'll be...right here, again! Single biggest day ever for fixBuffalo. Over 1100 unique visitors, surpassing my previous high of 725. Not bad for this little neighborhood blog that struggled to get 20 visitors a month two years ago. Most visitors arrived at fixBuffalo while doing a series of google searches for one of my favorite spots in Buffalo - Transfiguration Church on Sycamore Street. Sean Galbraith from Toronto - and guru of the DK PhotoGroup - let me know about a story that appeared on Channel 7 yesterday - East Side Church Falling Apart. This recent post - Inside Transfiguration, finally - features one of Sean's pix and is part of the reason why the spike in traffic today. This is one of my favorite pics...first thing you see as you cross the threshold, if your eyes are open! Sarah snapped this shot a few weeks ago. Check out her other pix, here. Traveling has rewards, yet I'm continuously reminded of the importance of the unplanned discovery and exploration right here in our own front yard. Really, very amazing. World's second best cheeseburger, Tuesday nite...can't wait to get home for the JudyBurger! Had the unexpected opportunity on Sunday to finally meet-up with the Buffalo Flickr Group at Spot Coffee on Elmwood. Really great group of people who are capturing digital moments all over the City and in some cases around the world. Check out the discussion group for some interesting posts and future meet-ups! Did a walk around the Artspace site on Main Street Sunday afternoon with a few local artists. Dropped the camera - it's now dead - more pictures will have to wait. So I found this stock photo that I received last year, for now - sorry. Really lots of progress. Come on over and check things out...especially the view from the backside along Coe Place. The folks from Artspace have tweeked their website about Buffalo, abit and have started to reveal some additional information about the project. Artspace Buffalo - now has some links to floor plans and a mildly confusing link to income restrictions and rental information. 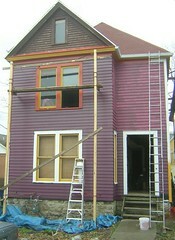 They have four construction photos - just two interior shots. From the new information, seems like Artspace will start making decisions on who's renting space in late Spring, 2007. For additional construction photos, see my flickr archive. 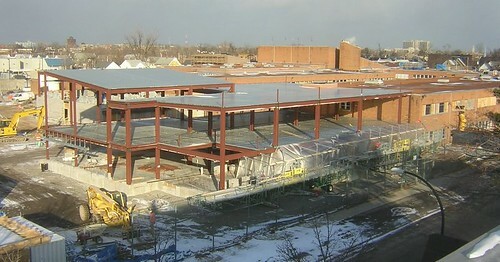 Early this week the scaffolding was placed along the walls of the new Art Wing, seen here in fixBuffalo's roof top shot. The roof and floor decking were installed, too. The masonry work on the new Ferry Street entrance was completed as additional walls were demolished and dozens of dumpsters were hauling away what was left of builidng's interior. First started keeping track of 125 Woodlawn Avenue years ago when a local contractor lived here. Perfectly nice little house. 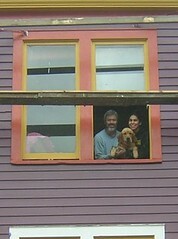 When he left town three years ago the house was ransacked. Owner is now the City of Buffalo. This past August I wrote about it here - The High Price of Red Tape. Links there to asbestos removal costs. This past week, as the photo shows, the asbestos shingles were removed. On this block [quikmap, satellite image]...directly across the street from the 30m renovation of the future home of Performing Arts HS...there are now 14 houses, used to 25 and of the 14 only six are currently occupied. Lots of opportunity for a community garden or school related agricultural project. This is still a perfectly good house and was last lived in three years ago. Great clapboard under the tar paper, foundation appears to be fine and house sits straight. Just haven't figured out why we are spending close to 20K to demolish it. Would have gone a long way towards restoration. Anyone want to venture why we do things like this. 30m across the street and another 20K to knock this down...Please let me know. Every Saturday...if weather's bad, just come on by the Sonic Café and we'll chat about the neighborhood. Newell and the BuffaloRising crew were great to include a post last week about a recent tour. One of North America's most gifted young writers of city things - Lisa Schamess from Washington DC - recently submitted a short piece that features some of my work here on the City of Buffalo's East side. The article, Everything Old is New Again appears in the December issue of American Planning Association's monthly magazine. First mentioned Lisa's work here - Connecting. There you'll find links to Lisa's blog and amazon reviews of her first novel. Lisa's work also helped make possible the recently released Blue Print Buffalo, which I've written about and linked to here - Getting Smarter about Decline. The hard copy of the article contains two additional pics, that didn't make it into the e-copy. Very lovely pix - here and here. Kevin Crowley is director of the University of Pittsburgh Center for Learning in Out of School Environments, and he and his team have been working on turning the urban environment into one big classroom. Students at UPCLOSE work closely with community partners, including the Carnegie Museum of Natural History, The Mattress Factory, The Warhol Museum, and the Children's Museum of Pittsburgh to help them think about how visitors use, talk about, and learn from their exhibitions. Also with us is Ken Hughes whose Blueprint for Santa Fe's sustainability is becoming a model for cities around the world. Ken is a member of the Sierra Club's Building Healthy Communities Committee and a Knight Fellow in Community Building at the University of Miami. Ken is also chief planner for the state of New Mexico's Department of Finance and Administration. Toronto area photographers continue to update me with additional pics of our own Transfiguration Church, corner Sycamore and Mills. And while looking through über-buffalo photographer Mike Calanan's flickr archive the other nite, I spotted the pic on the left - interior shot of St. Louis, from this past summer. Compared to the current state of Transfiguration, gives pause, huh? Mike's full flickr archive - right here. Check out his Queen City Gallery - really cool city views. If any one has access to Transfiguration interior shots from back in the day, let me know...thanks. 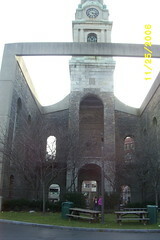 Posted this - Church Ruins - earlier in the week using a new java scripted flickr application. Contains pix in a slideshow archive thingy that is continously updated. Let me know if your browser - works fine in Firefox 2.0 - is supporting this. thanks. May consider using it again for other projects. If you haven't switched over to Firefox 2.0 what are you waiting for? Just do it. Makes life better and my little neighborhood blog here in Cold Springs looks tons better. If you are on network, ask your IT people. Thinking about vacancy and abandonment issues here in Buffalo, still. No matter how smart we think we are, still lots to learn from the experience of others. If you haven't already done so, check out Getting Smarter about Decline - defining material as we get smarter about our City's future, or not. I've been thinking outloud recently with a number of fixBuffalo readers, local preservationists and community planner types about the future of Transfiguration Church. Clearly, hope is not going to work in this case. Need something concrete to move forward. update...12/4/06...1115am for additional Transfiguration Church background check out the growing list of comments over here - Inside Transfiguration, finally. Two additional DK Photogroup slide shows just showed up - Michele's and Laurin's. Sean added a few to his, too - right here. I tossed out the idea, low-level green space development with a partial demolition - right here, last week. Turns out that we don't have to go all the way to England and parts of Europe to see a brilliant example of this adaptive reuse that we should call, no sugar coating and pretending now...Church Ruins. 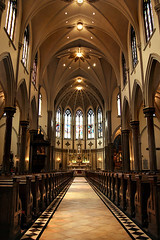 In Rochester, NY we have an example in St. Joseph's Roman Catholic Church. fixBuffalo reader sent me a recent post - right here - All That Remains and here - Island of Grace, very nice timing, to a Cincinnati based blog, Ten Reasons. Both posts provide some very well timed information about the Rochester model. These pics are all lifted from those posts. 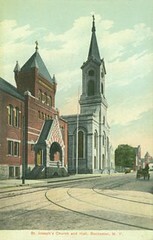 Here's a short history by Rochester Historian Vincent A. Lenti from the summer of 2001 - A History of St. Joseph's Roman Catholic Church [.pdf]. Excellent background about the social history of the parish and its German immigrant roots and information about the fire that destroyed the Church in 1974. The Landmark Society has recently published a book about Rochester's oldest Catholic Church, St. Joe's - The Oasis of Grace. This approach, while creating a rather unique urban environment of course also pays homage to the legacy of religous architecture that still resonates with people, today. I imagine at least by preserving some of the structure, people at some place down the road may realize, perhaps more than we do today, the importance and continuity of religion and the role it plays in our lives. (Re)-connecting to our past, by preserving in a practical and pragmatic way, with what remains of Transfiguration Church is a necessary next step. Lot of water over the dam on this one. It's time to craft a plan to get the job done and simply move forward. Oh, the stained glass...once the structure is stabilized, imagine the stained glass in the main concourse over at the Central Terminal, the best loved building in Buffalo! I've been interested in Internet and technology issues I guess since I was a kid. Bikes, cars and latest greatest gizmos. Question is does the Internet help or hinder the creation of new social - people based - relationships or hinder their full development. Two University of Toronto professors have been wondering about this, too. In - The Strength of Internet Ties [archived .pdf file] - Jeffrey Boase and Barry Wellman published their findings in conjunction with the Pew/Internet Report. Worth looking at if you are interested in the edge, where this world meets the matrix. Also located a string of articles Barry uses in one of his classes at UT - right here. In a previous post about the blogosphere I mentioned the former Dean of the Buffalo blogosphere - Alex Halavais, and his blog - Alex Havalais. Linked to him recently, here. The comments in this post, a post mortem about UB's School of Informatics, is priceless. For me the Internet continues to provide a meaningful way to build, develop and enjoy existing networks. Looping people in and expanding the network creates additional choices. Really got to say that if it wasn't for this blogging - that seems to have crunched time and space - wouldn't have met as many people interested in community, development and neighborhood issues as I have. Would have taken longer. Aside from the long slow re-introduction of Buffalo's near East Side to many people who might otherwise not have noticed - I know, no metric here, to suggest really either way, just a hunch - and preventing what would have been the demolition of the Hamilton Ward House...not much to show yet. Still putting the puzzle together. It's easier on-line. No subsitute for the personal. Just knowing when to have "face" with someone to get things done, is I think, a way different issue. 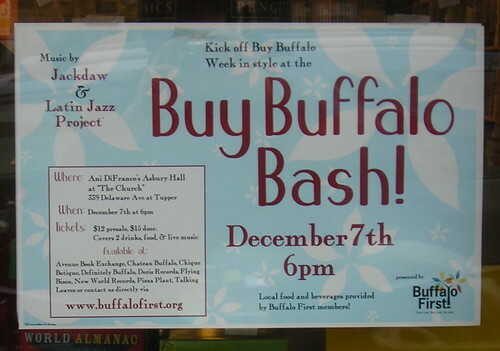 Buffalo First’s year-long buy local campaign aims to encourage Buffalo area residents to make purchases at locally-owned independent business whenever possible. We also encourage local "mom and pop" stores to source with Buffalo's farmers, producers and retailers; and work with local nonprofits, credit unions and other institutions whenever they can. Check out the member directory and you'll find one of Buffalo's coolest places - Old Editions Bookshop, on the City's near East side...you'll never know who you might bump into. I'll archive various links relating to the German Roman Catholic Orphan Home on this page. Make sure to check out this site, documenting the social history of this orphan home that includes a guest book with all sorts of entries from former residents. Prior to that original website going dark, as many Geocities sites did, I preserved the site via the Internet Archive. Another map shows the buildings and check out this 1915 map of Buffalo that provides additional context about the neighborhood and the city. If you are interested in other Buffalo orphan homes, make sure to visit Buffalo Orphanage Studies. Update - 12/5/10 - The social history documenting the GRCO is now available through the Internet Archive - here's that link, preserved. I've archived various GRCO photo sets below. Follow these links to flickr slide shows and photo sets. I've been wondering about the fate of the former North Jefferson Branch Library building for sometime. First mentioned it back here, May 2005 and linked to Bruce Jackson's Buffalo Report posting about what I still think was his incorrect assesment of the building's condition. Walked on by the other day - after looking at various locations in Artspace's Backyard - with representatives from a consortium of colleges interested in locating a site for a hands on urban studies program. Was amazed that the tree branches from seven weeks ago are still piled high. 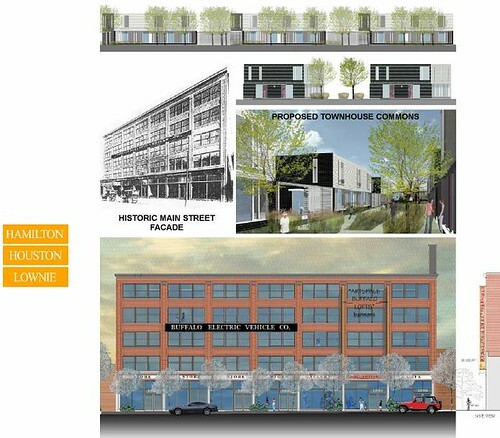 The Buffalo Economic Renaissance Corporation (BERC) is issuing a Request for Proposal (RFP) to provide the Architectural Services necessary to prepare construction drawings for the interior and exterior renovation of 332 East Utica Street. 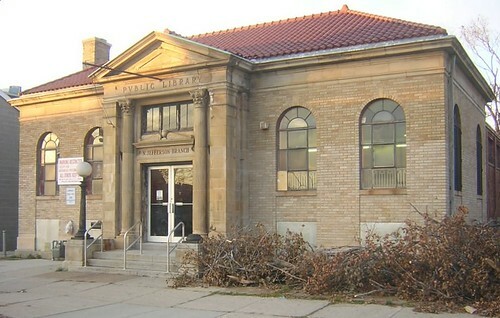 This former public library is proposed to be converted into business incubator space for professional service businesses serving the Jefferson Avenue commercial district on Buffalo's East Side. 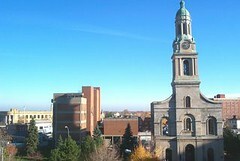 The RFP is available at 920 City Hall, Buffalo New York 14202, between 8:30 AM and 4: 30 PM Monday through Friday or online at www.city-buffalo.com. Proposals are due to the BERC by Thursday, December 21, 2006 at 2: 00 PM. Proposals received after theabove cited time will be considered a late bid and will not be accepted. Been writing about Coe Place since I started blogging a few years ago. And was first introduced to Buffalo's coolest one block street 10 years ago. This summer Roy and Jen - Maggie in the middle - have been working endless hours to bring their spot in the middle of the block up to speed. I've been tracking some of the developments in the Diocese's Journey in Faith and Grace - the strategic plan to consolidate and close various parishes here in Buffalo, NY. I've dubbed it Journey to Avoid Housing Court - and place many of my rants in Annals of Neglect, as sections of Buffalo - mostly the City's East side are still dealing with the previous round of church closings back in the mid 90's. Transfiguration of course being the poster child that we're still coming to terms with ten years after the doors were closed. 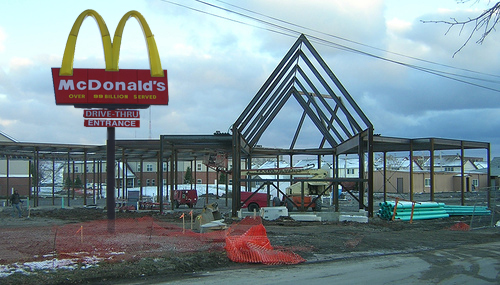 See more of Buffalo's newest McChurch - right here! The heart of the matter is presented on page 21 of this 32 page document. Here the 2005 priest level across the three vicarates making up the City of Buffalo include a total of 50 priests. In the next column, diocesan officals project a significantly lower number ten years down the road. Fast forward to 2015 and the priestly ranks diminish by 32 and according to this planning document the City of Buffalo is left with 18 priests! The time line for parish closings is outlined on page 9 of the planning document. Read it, brace yourself...it's happening sooner than you might think! Oh, imagine this...couldn't find anything in the document about adaptively re-using existing structures. There were a few lines about the need for creating some new structures...like the one pictured above.